Mohamed Salah completed a memorable day for Egyptian football by retaining his African Player of the Year award in Senegal Tuesday. 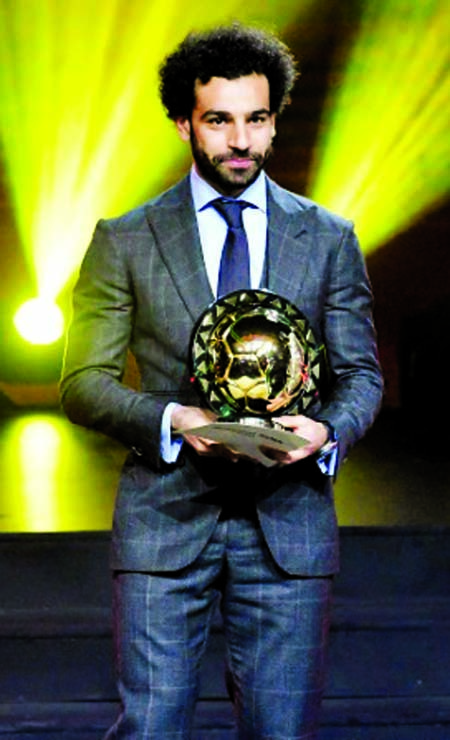 "I have dreamt of winning this award since I was a child and now I have done so twice in a row," Salah said soon after receiving his trophy in Dakar. "My thanks go to my family, my team-mates and my fans and I dedicate this trophy to my homeland, Egypt." Egypt crushed sole rivals South Africa 16-1 earlier on Tuesday in a CAF executive committee vote in Dakar to decide which country succeeded Cameroon as 2019 Cup of Nations hosts. Delays to preparations and concerns about security resulted in the central African nation being replaced as hosts, and they will stage the 2021 tournament instead. While the 15-vote winning margin for Egypt was unexpected, the success of Salah was anticipated as he continues to score regularly for the English Premier League leaders. Salah netted 44 goals in all competitions for Liverpool last season - his first with the Anfield club - and has bagged 13 Premier League goals so far this season. Salah was born in a northern Egyptian town Nagrig and used to make eight-hour return trips on buses to train with Cairo-based El Mokawloon (Arab Contractors). Spotted by scouts from Swiss club Basel, he moved there in 2012 before joining Premier League giants Chelsea two years later. Salah found scoring difficult early in his professional career and was nicknamed "chancentod" (chance killer) by the Swiss media. Later, playing for Chelsea in a League Cup tie, the Egyptian was so off-target with a goal attempt that the ball trickled over the touchline for a throw-in. Unhappy with his two-goal return, Chelsea lent Salah to Italian outfits Fiorentina and Roma, then sold him to the latter club. Salah blossomed in Rome, averaging close to a goal every two matches, and Liverpool paid almost 37 million pounds (about $47 mn/41 mn euros) to sign him two years ago. The Egyptian had his share of setbacks last year, too, with an injury in the Champions League final loss to Real Madrid also keeping him out of a World Cup defeat by Uruguay. He returned to score against hosts Russia and Saudi Arabia, but the Pharaohs exited their first appearance at the global showpiece in 28 years without securing even one point. Salah netted twice and missed two penalties three months later in a 6-0 Cup of Nations rout of Niger and snatched the late winner in a 3-2 victory over Tunisia in the same competition. Having defended his Player of the Year title, his next goal will be to match the four straight wins in the competition by former Manchester City and Ivory Coast star Yaya Toure.